Faculty excellence in online instruction is commonly encouraged. However, faculty excellence in advising receives little attention, and online faculty advising receives even less consideration. This article explores the concept and need for faculty e-advising, defined here as the systematic deployment of online instructional tools in a faculty advising capacity. State of the art e-advising tools that promote excellence include advising organizations, virtual office hours, videos, or video archives. Techniques to encourage and disseminate such advising practices are considered, as well as general limitations and challenges in e-advising. E-advising brings faculty advising to a medium convenient to online students, and in doing so may improve the quality of advising and student academic success while enhancing online student retention among other benefits. Bryant Johnson, a hypothetical online student at an innovative university, enjoyed his coursework immensely. The instructor created a rich online platform shell with ample resources, and facilitated discussion boards adeptly. With live online class sessions, instant messaging, and other resources, Bryant found his instructor engaging and informative. Bryant’s experience with his faculty advisor, however, was another matter entirely. He had never seen or spoken to his advisor in a two-way communication channel, but rather, had sought advice through multiple e-mails. He never received an immediate response and the communications he did receive were prone to misinterpretation due to the lack of nonverbal cues inherent in text- based communication. In stark contrast to his course instructor, Bryant’s faculty advisor was a distant and disembodied presence. Bryant’s experience of the chasm between online faculty instruction and online faculty advising is unfortunately quite common (Diaz Swearingen & Hayes, 2009; Luna & Medina, 2005). The challenge of faculty e-advising is to apply the rich array of online instructional technologies to faculty advising, in order to enhance both access to and quality of faculty-level advising for online students. Note that e-advising is intended to supplement rather than supplant face-to-face advising. Individual examples of faculty e-advising innovations abound, such as well-developed faculty Web pages containing course, discipline and degree specific information (Woods, 2004). Furthermore, several authors have encouraged the study of faculty advising excellence as a worthwhile academic endeavor (Gregory & Austin, 2004; Havice, Havice, Cawthon, & Ilagan, 2009; Luna & Medina, 2005; Marques, 2009). The purpose of this concept paper is to move beyond idiosyncratic examples of good faculty advising and to encourage the systematic deployment of online instructional tools in a faculty advising capacity. After providing examples of faculty e-advising using online instructional tools, the authors consider how to encourage and disseminate such advising structures and practices. Limitations and challenges in e-advising are also considered. To envision how instructional technology enhances advising, picture this: A faculty member in Alabama is conducting office hours for advising purposes. Meanwhile Sarah, a student in Kuwait, sits outside her military unit’s tent balancing a satellite laptop on her knee. On break from her duties, she uses the time to catch up on her graduate studies and to seek advisement on the next term’s offerings. Sarah virtually knocks and enters the online office chat room or instant messaging (IM) platform hosted by her faculty adviser (e.g. : 1 ; SKYPE ; Google Talk online ). The student is greeted by the faculty advisor on a Webcam feed ready for a live exchange during the designated office hours or during a serendipitous meeting when faculty is online while working. Sarah does not need to have a Webcam, even though the faculty advisor uses one to project a live image during the discussion. This encourages a richer mode of personal communication to discuss Sarah’s graduate degree concerns. If Sarah chooses not to utilize a Webcam with a microphone, she still has options for her part in the conversation. She can communicate in a text/chat mode, an audio mode using a microphone supplemented by the ability to type out questions, comments or answers. During their meeting, the faculty advisor may wish to discuss an advising form, set up a class schedule, or review part of the graduate catalog with Sarah. To accomplish this, a Web application share (appshare) is used to reflect a particular item on the advisors’ screen and simultaneously on the Sarah’s laptop screen in Kuwait. The face-to-face communication, the ability to view documents with the student, and live academic goal setting can be virtually achieved virtually. This real-time e-advising is the first tenet of the e-advising concept. The second tenet of the e-advising approach is the online organization shell as a resource pod for on-demand access. The online organization consists of a permanent advising course management system (CMS) or virtual learning environment (VLE) that maintains items important to student academic needs. There are several types of VLEs used by organizations and universities such as the following: Bb Blackboard Academic Suite ; WebCT; Angel Learning . The VLE is set up by the faculty advisor much in the same way an online course is arranged on the VLE. In order to encourage the students to visit and set goals with their faculty advisor, a permanent VLE allows information to be available in one area in which the student can easily access it. 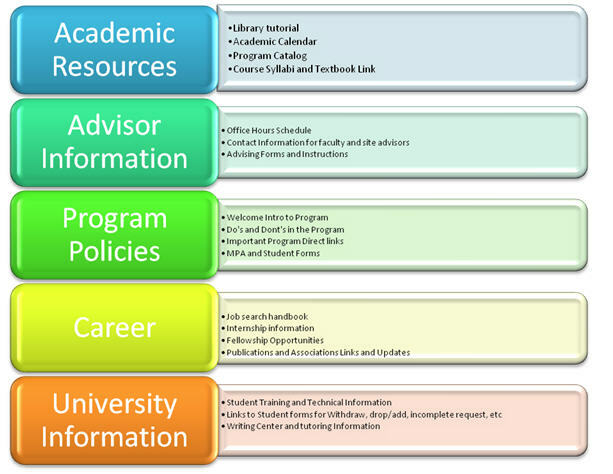 This organization layout should resemble those of the online course VLE formats so students do not encounter a significant learning curve to navigate through the advising information. E-advising utilizes the same virtual learning environment as academic courses to provide a one-stop-shop concept for relevant links and information to assist students in their advising needs. If a student needs an advising form, office hour schedule of the advisor, links to the catalog, course schedules, internship programs, ideas on paper topics, or downloads for the chatroom, they can access that through the advising VLE shell with a simple click of their mouse. Faculty members can group their student advisees in organizations so they can chat and have Webcam meetings during office hours. Special archived Webcam learning sessions can allow students to review pertinent advisee information in an online format that has 24-hour access. Pre-made videos of the faculty advisor talking to the students as they enter the advising organization allows the student to see their actual advisor and note the personality and sincerity of their intent to effectively advise. E-advising answers the question of how to provide timely, high-quality advising services to geographically separated online students and/or onsite students with conflicting work or family schedules that cannot readily come to office hours. For synchronous discussions, office hours can be held with an advisor ready to address advisee concerns in a live Webcam environment; students simply knock on the proverbial “cyber” office door. For access to common frequently asked questions (FAQs), forms, calendars, and tutorials, the students can visit the online organization platform. These two tenets of e-advising not only make a synchronous advising exchange a reality for online students, but can also provide all students a platform to visit and obtain advising information that is available 24 hours a day, seven days a week. Thus, e-advising provides an innovative answer in personalizing communication to effectively respond to students anytime, anyplace by coupling on-access demand with real-time advising personalized for the student’s needs and program. Faculty advising needs to evolve to include online advising for one simple reason—that is where a majority of growth is taking place. According to the Sloan Consortium (Allen & Seaman, 2010), growth in online student populations increased 17% compared to 1.2% for traditional students from 2008 to 2009. One in four students now has at least one online course, and with tough economic times pushing more people into colleges and universities, this trend is likely to continue (Allen & Seaman, 2010). Higher education has responded by spending millions of dollars a year to provide responsive virtual learning platforms such as Blackboard or WebCT to help online students better communicate with their instructors in a more visible virtual classroom environment. This principle applies to e-advising as well; in fact, high quality faculty advising may be even more important in the context of online education, where students may have limited face-to-face interactions. Herbert (2006) found that the most important institutional variable in retaining online students was responsiveness of faculty. E-advising enhances involvement by promoting connection with online students, and thus has potential to increase retention of online students. Surprisingly, e-advising also benefits traditional students. When a faculty member develops online advising resources and platforms, these can also be made available to their onsite students to help overcome limitations of work schedule conflicts, disabilities, and other issues that might prevent physical access to the faculty advisor. Moreover, with the e-advising resources the faculty member can now disseminate enhanced virtual advising rather than one-time face-to-face advising. Faculty advisors can easily sculpt a hybrid/blended approach of traditional and e-advising techniques by picking and choosing from the myriad of options provided here to enhance their service to online advisees. For example, an advisor wishing to avoid developing an advising VLE shell may still list all the advisees on the chat room program as contacts so a live contact for the advisor is available, or a scaled down limited advising VLE can be set up with only a Frequently Asked Questions section (FAQ) targeted towards online students. Alternately, the advisor may choose to develop the advising shell as a resource pod to contain on-demand frequently requested resources such as career or program sequencing items while forgoing the other options. Certainly any of these suggestions could be utilized in a hybrid approach. E-advising also benefits the faculty members that engage in online instruction. Technology learned in the process of creating e-advising resources can then be applied in an online course setting to the instructors’ advantage (and vice versa). 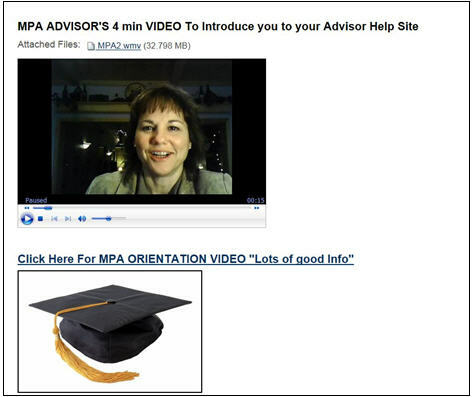 For example, as part of the e-advising effort, a welcome video was developed to introduce the advising VLE, a tool that was later adapted for use in the advisor’s online classroom. Similarly, after using the chat room or IM for advising, the authors recognized its potential use for online classroom response to question/answer sessions or participation in student group chat meetings to complete course projects. E-advising provides a critical foundation for subsequent online student learning (Al-Omary, 2010;Havice, Havice, Cawthon, & Ilagan, 2009). For example, if students take courses in the wrong order, this may jeopardize subsequent course success as well as their graduation. However, because many online students cannot access faculty advisement through the usual face-to-face interaction, e-advising is necessary to ensure they receive the same critical guidance and assistance throughout their program. E-advising is thus indispensable to subsequent academic and classroom success and a potential technique to enhance student satisfaction (which in turn may result in increased enrollments). As another example of how e-advising can build a foundation for academic success, on-demand e-advising library resources can provide students with tutorials and practice quizzes, equipping them with the research skills to succeed academically in their respective programs. E-advising can also be more efficient than traditional face-to-face advising. Consider a traditional advising scenario with 50 students. To advise these students, both the instructor and the student must travel to the same location during limited faculty office hours. After one student leaves the office, the next may enter and ask many of the same questions. If the faculty member distributes hard-copy resources such as career planning guides to each student, this incurs time and expenses for copying, filing and storage. Advising 50 students in this matter is inefficient. E-advising enhances efficiency because it eliminates travel time, copying expenses, and provides students with on-demand access to resources. This allows advisors to use the platform’s instant messaging (or onsite meetings if desired) to address more individualized questions such as what course to take next or what mentor to choose. The VLE advising shell, then, is particularly useful in serving as a resource pod and addressing questions that are commonly asked by advisees by providing on-demand access. The online instructor can simply develop an advising VLE shell with the same effort it takes to build an online course. No additional training is necessary because the tools are already utilized by online instructors. The setup for the VLE shell needs only to be accomplished once given that the advising VLE never closes at the end of semesters. The enrollment task of the advisor shell is simply the same as the undertaking of enrolling class participants in online courses. However, the advisees will remain enrolled until they are no longer an advisee. Subject matter and information posted on the advising VLE shell addressing frequently asked questions will automatically and immediately answer advisees visiting the shell, thus further enhancing efficiency. This gives the advisors more time to address more complicated advisee questions and provide specific individualized guidance through email or during office hour chat rooms. Information that needs updating such as catalogs or academic schedules can be added to the VLE as a link so students click on the updated information. More permanent and rarely changing information can be placed directly on the advising shell. This strategy minimizes ongoing maintenance requirements. Moreover, using a few simple techniques, faculty advisors can run virtual and physical office hours simultaneously, thus obviating the need to extend office hours for online advisees. For example, the chat room can be consistently running in the background while the advisor attends to usual work during regularly held office hours. The advising VLE can easily integrate transcript and banner programs as they do now on the online course formats accessible to the advisor to use while chatting live with a student. Most importantly, e-advising holds the potential to improve overall advising quality for online students. The literature suggests that the basic principles of quality advising include accessibility, timeliness, flexibility and creativity (Chun-Mei, Golde, & McCormick, 2007; Polson, 2003; Schlosser, Knox, Moskovitz, & Hill, 2003). Accessibility suggests that an advisor is available at varying times to accommodate student schedules. Timeliness refers to provision of immediate or prompt feedback. Flexibility is the understanding that not all student schedules or life situations are the same. Creativity refers to the ability to develop a remedy to specific challenges or constraints. By promoting greater access to the advisor through new media and by providing on-demand access to resources, e-advising improves two factors of advising quality, specifically accessibility and timeliness. Some advising best practices have previously proved difficult to utilize with online students, particularly the development of communities to foster a relationship and confidence between the student and the advisor. Gregory and Austin (2005) noted the importance of trust and familiarity in creating virtual communities so critical to student success. Building upon the importance of this relationship is the concept of appreciative advising. Illuminating the six phases of appreciative advising, authors Bloom, Hutson, and He (2008) explained that the interaction between the student and the advisor begins with introductions and small talk, eventually evolving by getting to know the student, learning their aspirations, helping them design strategies to achieve their goals, goal achievement, and finally helping to expand their goals. This description of a successful advisor/student relationship is complex and multifaceted, not likely to be maintained through a few information links on a Web page and a few e-mails between terms. However, these relationships would be nurtured through the more ready access to faculty advisors posited in the e-advising concept, and through use of the e-advising communication tools such as teleconferencing, synchronous chatrooms and more (Coates, et al., 2004; Luna & Medina, 2005; Redfern, 2008; Woods, 2004). The sections above introduced the two basic tenets of e-advising: (1) real-time advising online using instant messaging, chatroom or virtual classrooms; and (2) the virtual advising organization shell. This section further expounds on those two tenets and provides examples of additional advising strategies that utilize online instructional tools to constitute the online advising toolkit. Since many faculty members and students are already familiar with the virtual learning environment used in the university online courses, it is the optimal platform in which to launch the e-advising program. Instead of an online academic course, a VLE organization can be developed (which is very similar to the academic course format) as a single area in which all advisees and advisor have access. The advisor can access their list of advisees and information about the advisees and e-mail all or one of the advisees through the roster function. The VLE organization provides the faculty advisor with a rich cache of communication tools and a layout to display information that remains available to students throughout the academic term and can be easily edited for updates. Some tools that can be shared by the organization participants are access to a Webcam office hour chat room open only to the advisees and advisor through Instant Messaging (IM), or a virtual classroom meeting program access that can provide archived PowerPoint lectures on the degree programs, and YouTube video uploads that can show campus produced videos to assist students. The VLE advising organization also enables advising specific to the student’s discipline. For example, Brinthaupt (2010) described an innovative online career psychology seminar that included videotaped guest lectures, learning models, discussion boards for students, a resources area, and self-tests for evaluation. VLE environments are ideal for this type of discipline-specific advising, and individual advisors can either create their own resources or include links to departmental resources in their own shells. Other examples of potential discipline-related uses include virtual student research seminars throughout the department, discipline-related ethics or technical training, and more. Betts and Lanza-Gladney (2009) recommended real-time guest lectures, alumni lecture series, and virtual teas, as techniques to enhance online human touch that can be employed in a real-time or archived VLE setting. As another example, faculty advisors can provide an easy step-by-step, visually appealing snapshot of the student’s path through the degree process that highlights key areas or requirements that must be met. Additionally, the grade book area can be used to assist advisees in keeping track of where their progress is in the program. Advisees can use the advising organizations discussion board to post some of their experiences in the program for others advisees to read and comment on. Links to resume builders, grammar, writing links, and job links can also be posted in this advising forum (See Figure 1). Figure 1. Sample Advising Shell Table of Contents. Indeed, the VLE organization can encompass many of Wagner’s (2001) suggestions for an advising Web page: a clear explanation of core curriculum requirements, a FAQ section, informational pages for special populations/self-help assistance (e.g., freshman, undeclared majors, Americans with Disabilities Act information, students on academic probation, etc), links to university sites such as library, clubs, career services, and more. However, the VLE possess distinct advantages compared to a simple advising Web page, notably the communication tools built into the VLE tool. Moreover, the VLE page features the added advantage of limiting access to advising resources to the enrolled student population. Other important information to provide may include graduation processes, administration checklist items, degree catalogs, registration, campus contact listings, academic calendar, academic forms, paper topic links, campus e-mail instructions, course schedules, library information, APA and MLA reference format links, internship, fellowship, scholarship, job opportunities, resume information links, and faculty advisor biography and contact information. Utilizing the VLE tools, the faculty advisor can post announcements that are visible to all advisees on their home VLE courses page or contact selected persons individually. Entry into the advising organization is as easy as one click on the student’s VLE home page. To maximize effectiveness of office hours, office hours can be held on a two-way chatroom that has an integrated webcam, audio, and appshare capabilities as discussed earlier. IM programs also have an appshare function in which a paper or item on the desktop of the advisor can appear on the desktop of an advisee. This helps when filling out forms or showing parts of a catalog to a student. In the earlier example of an academic virtual chatroom, the personal touch afforded by this program over the traditional e-mail was evidenced. Figure 2 shows a snapshot of such a platform. Figure 2.Demonstrates document sharing in a IM appshare. Another live communication software program is a meeting room or virtual live or archived classroom ( Wimba Classroom ; Elluminate,Windows Meeting Space ) used for more complicated, involved discussions. This classroom offers a live or archived (pre-recorded) environment in which course slides can be projected on a white board while the advisor discusses the information that can be accessed at any time. The virtual classroom can be used to answer many common questions concerning a certain program or the order in which to take courses. There are various video software programs (e.g. : Windows Movie Maker, Nero, Roxio Creator, muvee Reveal Software) that can assist in providing quality three-minute orientation videos for the advisees to assist in navigating through the advising platform. Benefits of this method over e-mail, attachments, or posted announcements include: advisees meet the face and personality of their advisor, a personal connection is made as opposed to a stranger behind an e-mail, and the advisee gains information in a quick and interesting manner. Figure 3 displays a portion of the orientation video. Leaders can institutionalize e-faculty advising by encouraging or requiring full-spectrum training. When universities develop training sessions for new online instructional tools, that training should not stop simply at classroom instruction—it should demonstrate use of those tools in advising settings as well. When addressed in this manner it is more likely that the concept of e-advising will become part of the culture of the institution as opposed to receiving short shrift. The leadership (department heads, deans, chairs) must also embrace the technology and lead by example. Leaders should be first in line to employ the technology in their communications with faculty members. It can be frustrating if leaders do not use or at least conceptualize some of the basic opportunities presented by the software. If faculty advisors are asked to meet the dean in a virtual meeting such as virtual classrooms, the faculty are encouraged to use the technology and become acquainted with it. Important information for faculty members should be provided on a virtual classroom archives to demonstrate the capability to faculty members. Chairs can hold quick, short, issue-based group meetings on IM chats for 10 minutes on a common office hour day to ensure everyone receives the same information and can ask questions in a two-way forum. Conferences can be held online asking individual instructors to prepare some short information slideshows on their advising innovations as part of the conference. These are all ways in which leadership can encourage faculty innovation and excellence in e-advising. Similarly, the Association to Advance Collegiate Schools of Business (AACSB) also called in Standard 9 for its members to “Demonstrate how faculty members and staff fulfill the functions of curriculum development, course development, course delivery, academic assistance, academic advising, career advising, and other activities that support the school’s mission.” (AACSB-accreditation standards, 2011, p. 36). Student feedback gathered by these accrediting bodies may document more positive results in advising effectiveness when an advisor provides 24-hour access to important and relevant advising material and two-way communication accessibility during office hours. The faculty advisors themselves can also survey advisees concerning communications and the effectiveness of their advising information. Shared resourcing can also be encouraged. Many faculty advising resources (movies, archives about how to increase prospects of doctoral admissions, library research strategies, etc. ), can be shared with faculty permission, preventing duplication of resources and effort. Institutions can encourage this by creating a readily accessible sharing location, (Luna & Medina, 2005) such as an online platform shell or a Virtual Advising System (Havice, Havice, Cawthon, & Ilagan, 2009). For motivation, universities could utilize incentives such as an annual or monthly prize for best advising resource. Faculty e-advising requires some level of technological competence and on-going training since it utilizes online instructional tools. For faculty already teaching online there will be little or no learning curve involved since it utilizes the same subset of tools. However, onsite faculty that have not ventured into online education would require training. Also, some faculty advisors do not serve online students in any capacity. Thus, e-advising may not be necessary or efficient for those faculty members without online classes or online students, though even in these settings e-advising can augment traditional advising and enable students to overcome geographic limitations or scheduling constraints. Another limitation involves the lack of incentives for any form of faculty advising. Myers and Dyer’s (2005) research revealed that while most faculty believe advising should be rewarded as part of the tenure and promotion process, the majority of institutions do not do so. Scholars and professional advising organizations are increasingly calling for universities to reward traditional faculty advising excellence explicitly through the tenure and promotion process (e.g. Drake, 2008; McGillin, Ortgies-Young & Kim, 2010). Institutions that reward traditional advising should reward e-advising in a similar manner. Whether due to disincentives, technical factors, or other reasons, some faculty members may not wish to engage in e-advising. To overcome this, some administrators concentrate e-advising responsibilities with willing faculty members that demonstrate a proclivity towards online technologies, compensating them through reduced face-to-face advising responsibilities or other means. This strategy has the additional benefit of allowing selected faculty members to build expertise and promote innovation in e-advising. E-advising will also require an up-front investment of time to build the advising shell or other on-demand resources (though as discussed earlier, it is more efficient in the long-run). To reduce the effort involved, templates from seasoned faculty advisors using the tools can be shared with other advisors. Best practices should be discussed on a faculty discussion board with examples that can be easily copied by other advisors to add to their own programs/organizations. For example, a collection of needed links for students could be a section easily shared with other advising organizations. Lack of appropriate software can also present a barrier to effective e-advising. Thus, the institutional leadership should strive to ensure that an adequate array of software is available to facilitate e-advising excellence. University administrators should encourage use of new technology and provide adequate training opportunities as well as solid technical or instructional design support. Institutions can also hold online conferences and/or use online organization areas to share best practices. Faculty advisors may also have concerns that they will be unable to address student technological questions, such as connection issues or slow working videos. To alleviate this problem, it is important to provide informational technology, instructional design, and/or targeted software support so that students and instructors will have a ready source of technological assistance. The technology itself or “bad technomojo” (Waldner, McGorry & Widener, 2010, p. 13) can sometimes be a limitation in e-advising. Common technical problems occur for both student and faculty, such as slow download feeds caused by poor Internet infrastructure, firewall protections that block some of these communication programs on government computers, simple power or internet disruptions, etc. Many such problems are temporary and can be alleviated by updates to software, visiting college computer labs or public libraries if necessary until they can upgrade their home systems, or, as in the case of a service disruption, rescheduling the event. Evaluating e-advising will require new methods. A key challenge here will be developing survey and other tools to verify the added benefit of using online instructional tools (e.g., enhanced academic success, enhanced retention, etc.). Further baseline studies are needed to ascertain the gap between online instruction and online faculty advising, which e-advising practices work best, and why. General faculty course evaluations will not be adequate to study e-advising since they focus on the instructor rather than the advisor. As an immediate measure, advisors can seek feedback through discussion boards dedicated to suggesting improvements. Advisors can also track statistics measuring the usage and importance of the various parts of the advising organization. Additional research in this arena should is encouraged. It is time to harness the power of online instructional tools and apply them strategically and systematically to online faculty advising. E-office hours, VLE organization areas and more are only some of the potential tools. However, to realize the full potential of e-advising, leadership must encourage and institutionalize its use rather than relying on individual inclination. By systematically institutionalizing faculty e-advising, universities can ensure that the Bryant Johnsons of the future will experience excellence both in online faculty instruction and online faculty advising. Allen, E., and Seaman, J. (2010). Learning on Demand: Online education in the United States, 2009 . Babson Survey Research Group. Al-Omary, A. (2010). Building synchronous advising e-community using Blackboard Tools. The Third International Conference for e-Learning: The role of e-Learning in supporting learning communities. (p. 5). DOHA, Qatar: United Nations Educational,Scientific, and Cultural Organization. Astin, A. W. (1993). What matters most in college: Four critical years revisited. San Francisco, CA: Jossey-Bass. Betts, K, Lanza-Gladney, M (2009). Academic advising: Ten strategies to increase student engagement and retention by personalizing the online education experience through online human touch.Presented at the October 2009 NACADA Annual Conference, San Antonio. Bloom, J., Hutson, B., and He, Y. (2008). The Appreciative Advising Revolution. Champaign, IL: Stipes. Brinthaupt, T. M. (2010) Development and implementation of an onlinecareers seminar in psychology, Teaching of Psychology, 37: 58–62. Chun-Mei, Z; Golde, C. M.; McCormick, A. C. (2007). More than a signature: How advisor choice and advisor behavior affect doctoral student satisfaction, Journal of Further and Higher Education,31 (3), 263-281. Coates, W. C., Ankel, F., Birnbaum, A., Kosiak, D., Broderick, K., Thomas, S., ...Collings, J (2004). The virtual advisor program: Linking students to mentors via the world wide Web. Academy of Emergency Medicine, 11( 3). Crookston, B. B. (1972). A developmental view of academic advising as teaching. Journal of College Student Personnel , 12-17. Diaz Swearingen, C., and Hayes, J. (2009). Faculty advising in nursing education: Necessary evil or opportunity for excellence? International Journal of Nursing Education Scholarship,6 (1), Article 29 . Drake, J. (2008) Recognition and reward for academic advising in theory and in practice. In Gordon, V.N., Habley, W.R., & Grites, T.J. (Eds.). (2008). Academic advising: A comprehensive handbook (2nd ed.). (pp. 396-412). San Francisco: Jossey-Bass. Gregory, V., and Austin, D. (2004). Connecting students at a distance: designing and implementing a virtual community. IADIS – International Association for Development of the Information Society. Lisbon, Portugal. Havice, P., Havice, W., Cawthon, T., and Ilagan, G. (2009). Using desktop videoconferencing to promote collaboration and graduate student success: a virtual advising system. The Mentor. Light, R. J. (2003) Enhancing students’ college experience with specific advising suggestions. Academic Advising Today 26 , 2. Luna, G., and Medina, C. (2005). Using the Internet to advise university students at distant locations. 2005 NACADA National Conference, Code 158. Las Vegas, NV. Marques, J. (2009). Advising working adults at the graduate level: Diversity from pre-to post graduation. The Mentor . McMillin, V., Ortegies-Young, T.S., and Kem, L. (2010) Faculty advisor assessment and reward: A hot topic for our institutions. Academic Advising Today, 33, 2. Myers, B., & Dyer, J. (2005). Attitudes, value and preparation of university faculty and administrators for advising. Journal of Agricultural Education, 46, 3, 35-46. Redfern, K. (2008). Appreciative advising and the nontraditional student. The Mentor: An Academic Advising Journal , 1-5. Rendon, L. (1995, May). Facilitating retention and transfer for the first generation students in community colleges. Paper presented at the New Mexico Institute, Rural Community College Initiative. Espanolo, NM. Schlosser, L. Z; Knox, S.; Moskovitz, A. R.; Hill, C. E. (2003). A qualitative examination of graduate advising relationships: The advisee perspective, Journal of CounselingPsychology, 50 (2), 178-188. Tinto, V. (1987). Increasing student retention. San Francisco, CA: Jossey Bass. Wagner, L. (2001). Virtual advising: Delivering student services. Online Journal of Distance Learning Administration, Volume IV, Number III, Fall. Waldner, L, McGorry, S, Widener, M. (2010). Extreme Service learning (XE-SL): E-service learning in the 100% online course, Merlot - Journal of Online Teaching, Volume 6, No. 4. Woods, R. G. (2004). Creating a virtual advising center: Student services in an online environment. The Mentor. Manuscript received 25 Mar 2011; revision received 21 Nov 2011. Copyright © 2005-2011 MERLOT. All Rights Reserved.